Your retail location is your biggest advertisement. If you don’t think about your brand when you design your brick and mortar, your customers are going to notice. When Shany Kaufman was asked to build out a branding project for a cafe, she knew that their interior design was out of sync with the branding she had created, so she went out and drew up how she thought it should look. After that cafe became a huge success, Shany went out with her natural talent and flair to create one incredibly successful project after another. Her trick was infusing brand in space to create retail locations that matched with their brand. In this episode, Shany shares some top tips that you need to know when designing your brick and mortar store. She also shares her struggle of being the sole creative brain in her company and the systems she came up with to allow her to scale despite her limited bandwidth. Reena Friedman Watts is a super connector who can get into any door, but her business journey has been anything but conventional. She has worked every job from being a producer on the Jerry Springer show, to doing court research for Court TV. She is now in her first foray as an independent entrepreneur with her current brand as something of a do-everything freelancer. In this episode we help Reena find her core business concept as well as some top tips not to get taken advantage of, stop working for free and learn how to structure your first independent business. 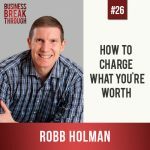 Robb Holman is a super inspirational serial entrepreneur. After a health scare and miraculous recovery in his senior year of college, Robb went on to catch the entrepreneurial bug and started multiple companies, his latest one being Rob Holman International. In this episode we discuss how to have the confidence to charge what you’re worth and make sure to collect money that is owed to you. We also discuss the struggle of trying to get your creative juices flowing when they’re just not coming and you’ve got a deadline to meet. 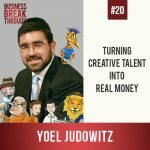 Yoel Judowitz relates how he has managed to scale a really individual and unique creative energy to a fully functional company, adding 5 figures of revenue monthly just from LinkedIn postings. He also shares with us the relateable struggle of finding balance as your company grows, which led to our discussion on the little recognized topic of work/work balance and the elephant in the room of small business success. Today we hear about Ashley’s amazing journey from herding chickens out in rural Arkansas to running an international publicity agency out of Malibu, California. Ashley is not only proof that if you dream it, you can live it, but her company, Appleseed Communications helps hundreds of women live their dreams by supercharging their business through publicity, while also supporting female entrepreneurs in developing countries 1:1 for every client helped. 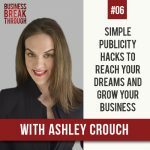 Ashley talks about her struggle with her growing popularity – how can she be available for potential new leads without compromising her time, and maximize the time she does spend on lead generation.